Baby, it's (still) cold outside, and this stew felt like the perfect supper today. Is this a soup? No, but in my books it's close enough to qualify for Souper Sunday status! What a great weekend I've had! Yesterday my awesome mother treated me to lunch and a spa day as a birthday present. We got facials, and then I got a massage while she was getting a manicure. It was so, so nice, and such a treat since the two of us are not really spa types normally. The spa that we went to was in the mall, so we popped into a few stores, including the bathing suit store for a total of two whole minutes...after just having had a lunch (with wine) and spa day everything in there just looked really...tight. I'm going to Las Vegas with some friends at the end of this month (And. I. Can't. Freaking. Wait. ), so the time came today to go back to the bathing suit store from yesterday and pick out a new bikini. As it turned out, instead of going to the bikini store, perhaps I should have instead visited a gym. Sigh! I did decide on one suit though, and the pattern is hilariously called Colourful Leopard / Water Beast (from the store's "80's Collection" no less), which seems slightly outside of my normal comfort zone, but I supposed anything goes in a bikini pattern really. Anyhoo, none of this has anything to do with the beef stew that I made for dinner tonight! Except that I'm definitely, definitely not doing myself any favours when it comes to that looming bikini-wearing weekend later this month. The chocolate that I am currently eating - also not helping. I made this stew gluten free just by substituting Bob's Red Mill Gluten-Free All Purpose Flour for the regular stuff, but you could just make it with normal flour too and substitute like normal. Who doesn't like a beef stew? 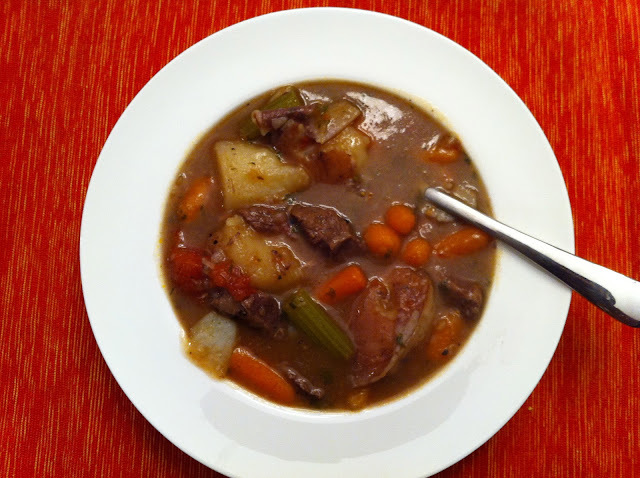 Carrots, celery, onion, potatoes, beef, broth, herbs, maybe a splash of red wine - it all comes together so nicely. I love how the beef just falls apart in your mouth. It's one of those 'stick to your bones' meals that can warm you up and keep you satisfied. Pair it with a nice crusty bread and you're set. I got this recipe from the Food Network website. I hope you enjoy! Place a large pot over medium-high heat. Pour in enough vegetable oil to fill the pot to about 1/4-inch deep. Season the beef with salt and pepper, and add to the pot. Saute the meat, uncovered, stirring only occasionally, until well-browned, about 8 minutes. Using a slotted spoon, transfer the beef to a plate. Discard the oil from the pot. Preheat the oven to 325F. Return the pot to the stove and melt the butter over medium-high heat. Add the onion and cook, stirring often, until onion is lightly browned, about 5 minutes. Add the crushed garlic and cook, stirring often, for 1 minute. Add the tomato paste and cook, stirring often, until lightly browned, about 1 minute. Add the reserved beef back to the pot, and sprinkle the flour over top, then cook until lightly toasted. Add the water and broth and bring to a simmer. Tie the parsley, thyme, and bay leaves together with a piece of kitchen twine, and add the bundle to the pot. Season with 2 teaspoons of salt, or to taste. Cover the pot and transfer to the oven for 1 1/2 hours or until meat is just tender (ensure that you are using an oven-proof pot, and if not then instead just continue to cook the stew on the stovetop at a low simmer for 1 1/2 hours). Remove the pot from the oven. Skim the fat from the top of the cooking liquid with a spoon and discard. Add the potatoes, carrots, celery, and tomatoes, and bring to a simmer on the stovetop. Cook, uncovered, stirring occasionally, until the liquid thickens and the vegetables are tender, about 1 hour. If after an hour the mixture is not thick enough for your liking, then add a few tablespoons of regular or gluten-free flour to a small bowl, add a few tablespoons of water to the flour, whisk until the flour dissolves, then pour into the stew and simmer for an additional 10 minutes. Stir in the vinegar and season with salt and freshly ground pepper, to taste. Stew will thicken as it cools. Enjoy!